Meet the 2017 Iowa Character Award recipients! Every month we will be celebrating one of the 2017 Iowa Character Award recipients. 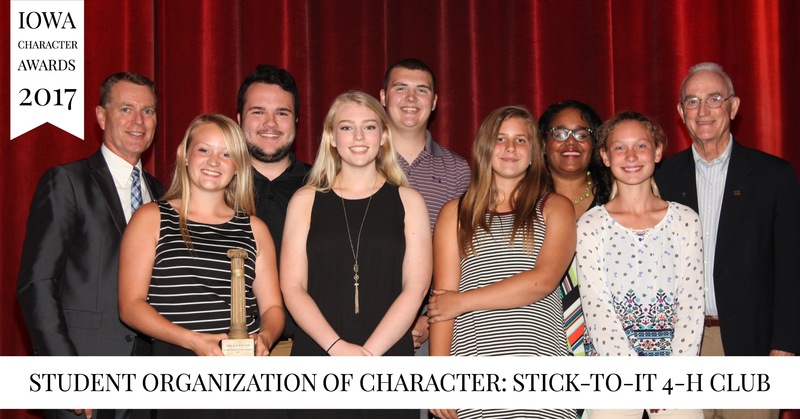 This month we’re celebrating Stick-To-It 4-H Club, the 2017 Student Organization of Character Award recipient! Stick-To-It 4-H Club in Sigourney demonstrates good character by serving their community and inspiring young people. The club has been in existence for 90 years and is committed to helping members realize their potential to make a difference in the world. With a mission to give back to their community, Stick-To-It 4-H Club contributes by keeping the county fairgrounds clean, delivering cookies to local nursing homes, collecting items for the local food pantry, and participating in other service projects. Members also have raised funds to restore the town fountain and replace flags at the extension of office. Many members of the Stick-To-It 4-H Club are second and third generation members, following in their parents and grandparents footsteps. Group leaders teach the value of hard work, perseverance, and how to work together as a group. Take a look at Stick-To-It 4-H Club’s award video here! Check back next month to learn more about the 2017 Iowa Character Award recipients!